Stephanie Dowrick regrets that due to the volume of requests and time constraints, she cannot reply to individual requests for information or support. She is not available for personal psychotherapy. Instead, she offers regular support through her “Stephanie Dowrick- Public Page” Facebook page and also through the Universal Heart Network, both of which can be accessed through this website, where she also posts regular articles (under “Blog”). 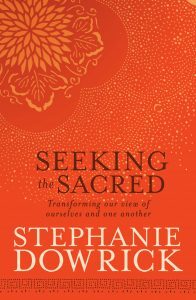 Please note that Stephanie Dowrick offers regular public support both through the spiritually inclusive services she leads at Pitt Street (264) Uniting Church, Sydney (3rd Sundays, 3pm) and through workshops and residential retreats. See Events. In addition, you can view Stephanie Dowrick’s talks from the interfaith services via this LINK. You can hear longer retreat talks and some interviews via Talks on this website. In her capacity as a life-long social activist, she also posts often on Twitter. Books are available in both print and e-editions from your local bookstores and via on-line booksellers. Or from Allen & Unwin in Australia and NZ, or Tarcher/Penguin for the UK, USA and English-language editions in Europe. Meditation CDs – including Peaceful Mind, Self-Love, Grace & Courage and Heavenly – are available via MILLTHORPE BLUE. Audio versions of Forgiveness and Other Acts of Love, In the Company of Rilke, Seeking the Sacred are available as CD sets or as MP3 downloads – read by Stephanie Dowrick – from Bolinda Publishing who also publish an audio version of Stephanie Dowrick’s Choosing Happiness, read by Carmen Warrington. Reverend Dr Stephanie Dowrick has been leading retreats at Mana Retreat Centre twice-yearly for more than 15 years. She also speaks and teaches in a variety of settings on life-changing, life-enhancing contemporary psychological, ethical and spiritual issues. Dr Dowrick is occasionally available for retreats and spiritual days of refreshment, and also for a limited number of bookings with corporate, community, educational and health organizations and groups, as well as with spiritual communities. Details of availability and costs are available from stephanie @ stephaniedowrick. com (please JOIN THE SPACES – we have typed the address in this way to block spammers). We ask you to note that Dr Dowrick does NOT have regular secretarial help. If you do not receive a reply to your speaking enquiry in good time, please feel free to write again with your request, and apologies if this is necessary. Reverend Dr Stephanie Dowrick leads monthly spiritually inclusive Interfaith services at Pitt Street (264) Uniting Church, Sydney. She has done so since 2006. These services offer a rare experience of genuinely inclusive spirituality, with beautiful music and uplifting teachings. Books and CDs are available after most services. All very welcome. 3rd Sundays of each month 3pm (not January). publicity@allenandunwin.com Telephone: 02 8425 0416. Contact Andrew Yackira Andrew.Yackira@us.penguingroup.com at Tarcher/Penguin (USA). Updates and inspiration are available from Stephanie Dowrick through the Universal Heart Network. It’s free to join and you will receive a mailing about 10 times a year. The Universal Heart Book Club was launched in 2012 by Stephanie Dowrick and Walter Mason. Please visit and enjoy. Stephanie Dowrick can no longer reply to individual requests for information or support. If you wish to contact her with a prayer request, or to share your experiences of reading her books or articles, or attending a workshop, service or retreat, she will receive and read those emails with interest, compassion and gratitude. We suggest sending them either using using stephanie @ stephaniedowrick. com (close gaps). But we would again ask you to understand that Dr Dowrick CANNOT reply personally, and deeply apologizes for any disappointment this causes.